The following figure shows the major internal components of the Windows operating system. 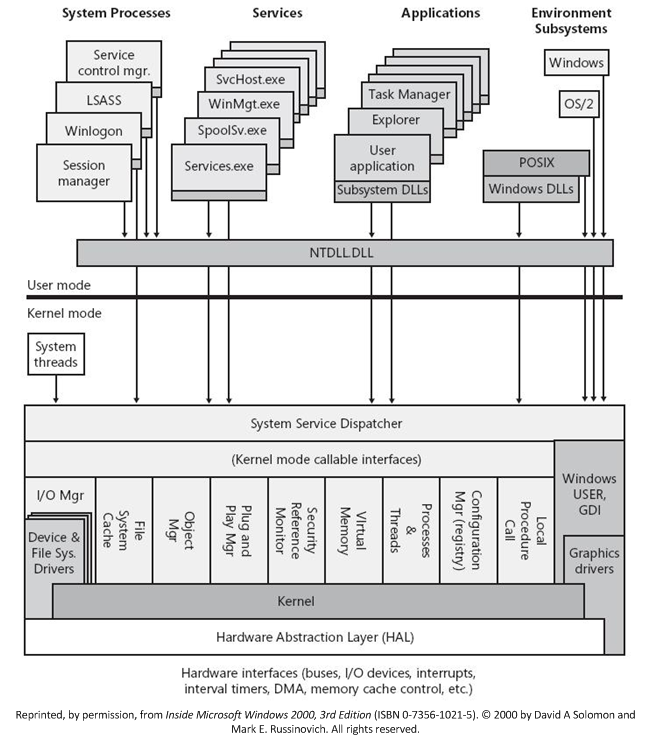 As the figure shows, the Windows operating system includes both user-mode and kernel-mode components. For more information about Windows user and kernel modes, see User Mode and Kernel Mode. Drivers call routines that are exported by various kernel components. For example, to create a device object, you would call the IoCreateDevice routine which is exported by the I/O manager. For a list of kernel-mode routines that drivers can call, see Driver Support Routines. In addition, drivers must respond to specific calls from the operating system and can respond to other system calls. For a list of kernel mode routines that drivers may need to support, see Standard Driver Routines. Not all kernel-mode components are pictured in the figure above. For a list of kernel mode components, see Kernel-Mode Managers and Libraries.